He’s one of my favourite conductors. I admire him for the nobility of his performances and the rapt intensity he can produce. 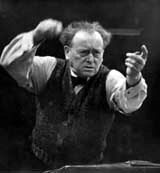 In my opinion he is one of the greatest “historical” conductors, along with Furtwangler and Scherchen. And like Furtwängler and Scherchen the recordings are mostly live, they are often hard to find, and interpretations differ. Schubert 9 – the live recording (1940), unavailable commercially as far as I know, I'm afraid. For recordings, some of the best transfers are from Hubert Wendel at http://www.willem-mengelberg.com/fr/fr-archive-mengelberg-cd.html. He is a joy to deal with. Also Tahra , Naxos and Opus Kura. I totally agree with you; very few conductors have been able to consistently produce such interesting and engaged music-making. There´s really a lot on you-tube now, including lesser known recordings like the Debussy Fantaisie and Rach 2.Cto with Gieseking, the Tchaikovsky 1.Cto. with Conrad Hansen, Franck orchestral works etc. ... And he´s been widely circulating on super-budget labels especially in Germany. Unfortunately, Mengelberg´s recordings are so dated that the sound quality often will discourage people from trying them; but they should make the effort - what a contrast to the routinely performances found in so many cases elsewhere ! Yes -- but unfortunately the Rach 3 with Gieseking isn't on youtube. Some of the sound is very good -- as I type I'm listening to his Beethoven 6 on the Tahra CD I mentioned and the sound is outstanding. The Eroica I mentioned has inferior sound, but it is certainly one of the finest Eroicas ever -- no one is more inward in the extraordinary music of the basses at the start of ii. He also recorded a work by his Dutch composer-colleague, Cornelis Dopper - the "Chaconne" for orchestra, which is likewise on you-tube. His Dopper chaconne is indeed impressive, as is the 7th symphony - it sounds quite different from the straight-forward Bakels recording. Mengelberg was fantastic accompanist. Beside already mentioned Rachmaninov with Gieseking do check out Schumann concerto with Emil von Sauer on youtube (Arbiter otherwise). Always makes me sad there isn't any more Schumann from Mengelberg. Could you be more specific about some of these? Is the Beethoven #2 the same as appeared on Philips LP in a big box of mostly live recordings with the Concertgebouw 1939-1940? Is the #6 on Tahra different from the one on that set? I thought the Schubert #9 with the Concertgebouw on Philips CD was live too - a remarkable performance, anyway (I can't check now). Which Heldenleben do you mean? I prefer the 1927 recording with the NYPO by a long shot. The Mahler #4 is a classic, of course - I would like to mention the live premiere of Bartok's Violin Concerto, the Tchaikovsky Romeo and Juliet, the Tannhäuser Overture (which one I cannot say at present), and what is for me the definitive interpretation of Bruch's Violin Concerto #1 with Bustabo. I have not listened to him much recently - in the 70s I enthused about his interpretations with someone who turned me on to him and went to get the odd obscure dim or crackly sounding LP at the London shop of Michael G. Thomas , who was a great Mengelberg supporter and did much for his reputation, I believe . The Matthäuspassion is astounding; Erb is price- and timeless, of course, and it has an unrivalled intensity, though sounding nothing at all like any other Bach played from the 50s to the present day, in my experience! In fact I find his Beethoven also often sounded as if channelled by other composers at times: Liszt, Bruckner, Mahler. One of those crackly dim LPs has Gieseking playing the Liszt Piano Concerto #1, by the way: tremendous, the Germans would say fulminant. Is the Beethoven #2 the same as appeared on Philips LP in a big box of mostly live recordings with the Concertgebouw 1939-1940? Is the #6 on Tahra different from the one on that set? Yes it is (it's 22 May 1938) and it is superior in every way to the Philips. My favourite recording of my favourite Beethoven symphony. I thought the Schubert #9 with the Concertgebouw on Philips CD was live too - a remarkable performance, anyway (I can't check now). I'm not sure either (I'll check tonight) I'll put the 1940 on symphonyshare in the next few days. Which Heldenleben do you mean? I prefer the 1927 recording with the NYPO by a long shot. I meant the December 11-13 1928 with the NYPO. I have it on Pearl: an Orbert-Thorn transfer. -- I'll edit the original post to make that clear. I have not listened to him much recently - in the 70s I enthused about his interpretations with someone who turned me on to him and went to get the odd obscure dim or crackly sounding LP at the London shop of Michael G. Thomas , who was a great Mengelberg supporter and did much for his reputation, I believe . Was that a very strange place near Paddington Station? With a lot of Melodiya LPs piled high in random disorder, filthy, dusty, and an elderly gent with tatty old clothes who smoked a lot? I sent you a PM about two hours ago. Just listened to Mengelberg 1939 Schubert 8th, first movement. Great conductor, great orchestra. Visceral emotions and tragic with a capital T. What more could anyone ask for? Beats me. I meant the December 11-13 1928 with the NYPO. I have it on Pearl: an Obert-Thorn transfer. -- I'll edit the original post to make that clear. Your description sounds familiar - except for the smoking and the address, which was Lymington road, N.W.6. He had a huge store of knowledge about vocal recordings, produced some Mengelberg LP reissues himself and a discography, i believe, sold records all over the world. - Yes, of course, Scherchen, which I listen to more often. But the Mengelberg has moments of timeless raptness that, to me, are unparalleled. Pity he/the concert transmission left out my favourite aria - "Mache dich mein Herze rein". I must look for that Tahra Beethoven #6. I first met him in Lymington Road NW6 in about 1984. I remember finding the shop. I lived between Swiss Cottage and Belsize Park, and I used to go shopping in Waitrose on the Finchley Road. Well, one day I decided to explore a bit further up towards Hampstead and I stumbled across the shop. I was into opera at the time and I remember my first purchase was a recording of Salome with Vickers singing Herod. He moved from Finchley Road to Paddington. I went there a couple of times -- he seemed in a bad way actually. Very unkempt and insalubrious, sitting in a cold damp shop, piles and piles and pile of LPs everywhere. I wonder what happened to him. At the time I thought "what a terrible life" -- now it doesn't seem so bad. Is that what they call the wisdom of experience? You must know Gramex too I suppose -- do you remember "NO RIFF RAFF"? That shop -- which is now on The Cut near Waterloo Station, is the same as it always was. Didn´t know about the Chopin with Cortot - it turns out that it is partly on youtube as well. Thanks. Malibran Music released two double CDs containing two complete concerts with Mengelberg conducting Paris Radio Orchestra in January 1944: Tchaikovsky 6th and Franck symphonies, Dvorak Cello Cto with Tortelier and Chopin 2nd with Cortot. Ah, that explains it. I probably don't remember his smoking because I was enveloped in a cloud of smoke myself in those days. I believe Mr Thomas has since died. One can find tributes to him online. - I didn't know Gramex - I didn't live in London, was visiting on a regular basis for several years and stayed in West Hampstead. Not having very much money, I did not roam very far afield. There was a place near Charing Cross station, I remember - too expensive for me. If I didn't feel too old to work on a regular basis and had some money to spare for the starting capital, I think I'd like to run a combined poetry and recorded music shop here in Berlin - preferably not cold and damp, though. Thanks to "tinear," a misnormer if there ever was one, for identifying the takes and sides of the NYP-SO Egmont overture! Wilhelmus Praeludium NYPO. 24.4.14. Matrix C 29,790, which is included. An electric test pressing of the rejected take 1 of Tchaikovsky: Serenade Waltz. 28.5.12, COA, has also surfaced. I am proud to have contributed it to the Pearl reissue of his complete Columbia recordings. I have added other test pressings, owned by other collectors, but they all use the same takes as the published discs. May have better sound. Also, alternative takes for all sides of the NYP Heldenleben have surfaced. They are not included, since they have been issued only on Biddulph WHL 025-026CD and hence are in copyright. In addition, Telefunken accidentally issued in 1994, and for the first time anywhere, on 4509-95515 (CD), the remake in, I think 1942.4.15, of Beethoven's Symphony No. 5 (Old No. 6), thought it gave the data 1937.5.4) and timings of the recording that was actually issued on Telefunken SK 2210/3 (and Capitol 87092/5 (78 rpm), EDL 8110 (78 rpm set), KDM 8110 (45 rpm), and P 8110 (33 rpm)). Being under copyright, I have not included it. 1941.4.22 on SK 3176/80 and Capitol P 8103 (33 rpm). The problem is that reissues, esp. on CDs, often mix the two recordings. Here, you have them from the 78s, and there should be no confustion. A large number of live perfroances have been offered for sale, but only the St. Matthew Passion on Columbia and twelve LPs on Philips are less than fifty years old. Highlights are Schubert 9 (Old No. 7), Mahler 4 (the most authentic recording ever issued, tied only by the recordings of the Bohemian Quartet), Brahms 1 (the only original issue in my collection), and all the Beethoven symphonies except the Eroica. They are all my favorite recordings of the music. His live performances are even more exciting than those he made in the studio! The brass rings incomparably in the Schubert (Mengelberg is to brass as Scherchen is to drums). Beware, though, confusion in identification of recording dates given in various issues. There have been a few spurious issues as well. These 78s constitute the core of the recordigs of the greatest of all conductors. VICTOR acoustic recordings, New York Philharmonic Orchestra, probably made in Camden, N.J.
COLUMBIA with the Concertgebouw Orchestra of Amsterdam. All Concertgebouws were recorded in Amsterdam. BERLIN PHIL. ORCH. 40.7.11 Berlin. ODEON, COA, not issued by Columbia Tchaikovsky 5:3,2. 27.6.10. Odeon. 123,533/5. Ronnie Russell told me he had the outer two discs, and Don Hodgman later told me he had just gotten the middle one. I informed Don of Ronnie's discs and Don repaired to Ronnie's and made a trade. I add some fillers here, which I announce and which I shall replace in case anything new turns up. Will someone tell me what they are? I've found two Mengelberg videos on the Hungarian "Filmhíradók" website (Filmhíradó is an old form of news "broadcasting" in Hungary when news was presented in cinemas. It was very common in the first half of the 20th century.) These are very short but maybe you will find these interesting. Virtually anything orchestral but especially the romantic period. I was recently listening to Toscanini's take on Ein Heldenleben with the NBC symphony orchestra and, among the Youtube comments, someone mentioned Mengelberg's 1928 New York performance. Although I have his 1941 Concertgebouw recording, I would like to get the earlier version which, although it's possible to hear the first 4 minutes on a couple of internet sites, leaves me wondering about the rest of the recording. Despite the very old sound quality, it's better than the later performance with amazing precision and dynamism. Is there any way I could hear it over the internet or is it available for purchase as a CD ? His Strauss tone poems are probably the most creative and memorable before Karajan. I didn't know that Mengelberg was the dedicatee of Ein Heldenleben until today. I have just sent off for his 1928 NYPO recording of it that's on CD with pieces by Bach and Ravel and I'm very much looking forward to hearing it. Other recordings of his that I have were made somewhat later but 1928 must have been a vintage year if this version of Oberon is anything to go by. Why is it that amazing performances of this stature are no longer heard either in concert or on modern recordings. The energy released here sometime threatens to blow up the recording venue.